Hello, hello, my lovely friends! Yep, just $5.99 (Cindy, you were the closest with your guess on Facebook :) I couldn't believe my eyes at first. Score! I immediately called my husband and told him that we are getting it. To sweeten the deal even further - even though it was super-sweet already - I used a 20% coupon that I got after donating a bunch of stuff to them, so in reality I only paid $4.69 for it. As I mentioned in yesterday's post, it's very solid though does need a bit of help. But all of it is cosmetic, and I can see this piece lasting us for years and years to come. And did you get any good deals lately, whether in a grocery store, from thrift stores or classifieds, or, maybe, yard sales?? Love it! You can make a cute pad for the top. I saw some really nice handles at Habitat for Humanity store. Do you have one there? Check it out! This is the best sort of buy Lena!!! It makes you feel so good,don't you think? I actually picked up something that was by the dustbin the other week .....mmmm think it might make a good topic for a post! How are the little ones ? Wow, what a great price! 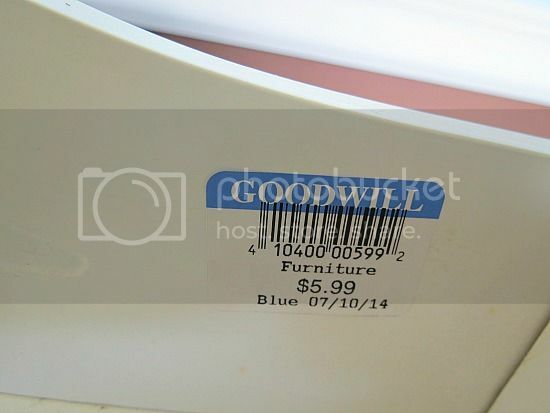 None of the thrift stores around here ever have furniture that cheap. Can't wait to see what you do with it. Wow that is great, I'm so glad you were able to get such a great deal. I'm sure you will do a terrific job sprucing it up, I am always amazed by your talent with things like that! Josh used his Toys R Us bday coupon and with 80% off clearance, he got three things for $0.21! I knew the price would be low but this is amazing, I am so happy for you!